What does the ACCC domestic mobile roaming inquiry mean for you? Vodafone has provided its submission to the Australian Competition and Consumer Commission (ACCC) domestic mobile roaming inquiry. Vodafone Chief Strategy Officer Dan Lloyd sits down with Red Wire to explain why Vodafone supports the ACCC’s inquiry and how domestic roaming can improve choice, coverage, and value for mobile phone users in Australia, and how it’s common practice in similar countries internationally. RW: What is domestic mobile roaming? DL: As with many things in Australia, there’s a significant difference between what’s available in major cities versus our regional and rural areas – mobile coverage is one area where the divide is real and significant. People living in major cities have access to three major mobile providers and a host of smaller competitors. However, the further you travel outside metro areas, those offerings quickly dwindle until you end up in some rural and remote areas with only one provider – Telstra. This means that if you live in regional Australia and are lucky enough to have coverage, then you don’t have a choice – you have to be a Telstra customer. However, regulated domestic roaming presents an opportunity to change this. It would mean customers of mobile providers other than Telstra would have access to mobile coverage in these areas. So, regardless of your provider, you would always have access to the broadest possible coverage no matter which provider you’re with. This is much like international mobile roaming. When you land in a different country, your mobile automatically connects to international mobile networks. Domestic roaming means you can use your mobile wherever there is coverage, regardless of which provider you are with. This type of arrangement would see mobile providers pay each other a fair price for access so their customers can automatically and seamlessly use each other’s networks. RW: What is the point of the ACCC inquiry? DL: We know how frustrating it can be for people who are living, working, and travelling in regional and rural Australia to have mobile reception one minute, but none the next. We question how this can be the case when taxpayers have spent hundreds of millions of dollars to improve mobile phone services in regional and rural Australia. And yet the very same taxpayers can see a mobile phone tower from their car window but no service bars on their handset? In realising how important reliable mobile coverage and choice of service provider are for Australians, particularly those living in regional and remote areas, the ACCC has decided to conduct an inquiry to explore the extent to which domestic roaming would promote competition among mobile providers and its effect on investment in mobile infrastructure. RW: How would regulating domestic mobile roaming affect Australians? More efficient infrastructure sharing, which will deliver better value for the Australian taxpayers’ dollar* and genuine competition for regional mobile subsidies in the future. Unfortunately, it seems unlikely that any of these benefits would be possible without regulatory intervention. RW: Surely, these benefits will have to come at a higher price than what I currently pay. DL: We haven’t seen that happen in the many other similar countries that have regulated domestic roaming. If anything, consumers will see the many benefits of competition. In other words, Telstra’s market power (arising from its monopoly position in regional and rural Australia) means its prices are significantly higher than they would be if there was genuine competition across the country. RW: Why doesn’t Vodafone build its own network in regional areas? Some have asked whether Vodafone wants to piggyback on Telstra’s investment. DL: The biggest investors in regional telecommunications have been Australian taxpayers, and Vodafone and the rest of the industry have also been required to give Telstra substantial subsidies for its regional network. It doesn’t make sense that access to networks funded by taxpayers and the rest of the industry is available only to Telstra customers, particularly when others such as Vodafone are prepared to pay Telstra for their customers to access the available service. Telstra has received $1.9 billion in government and industry subsidies* over the last decade which has given it an unfair advantage in deploying mobile services in regional and rural Australia. Between 2012 and 2014, for example, Telstra received $39 million from the Western Australian government to increase Telstra’s mobile network coverage from 430,000 square kilometres to more than 525,000 square kilometres – an increase of 22% in Western Australia. It’s pretty ironic the company that has accused us of wanting a “free ride” has only built its regional network with massive subsidies from taxpayers. In Australia, it’s simply not viable to build more than one mobile network in many regional areas, due to the high cost of mobile network deployment – particularly without significant taxpayer support that has enabled Telstra to extend its monopoly coverage to over some 60 percent of the total mobile coverage area in Australia. Vodafone’s track record shows we have put our money where our mouth is: We’ve invested more than $3 billion in recent years to expand our coverage footprint by 40 percent, upgraded more than 4,000 sites, and added 750 new sites to our network since the beginning of 2014. On top of this, we are building new regional sites, including 75 as part of the Australian Government’s Mobile Black Spot Program. We’re clearly not shy of investing billions of dollars wherever it makes sense, but it makes a lot more sense in regional Australia for the industry to collaborate, build, and extend one mobile network. This is what roaming would enable. RW: On the point of investments, Telstra said regulating domestic roaming will reduce its incentive to invest in rural and regional Australia, which has many people concerned. DL: We look at the facts on this one. Is it really a coincidence that domestic roaming has been regulated and continues to operate very successfully in virtually every other western country with a large land mass and low population density? Is Telstra’s position really that domestic roaming has worked in many similar countries for many years (in the USA since 1981, New Zealand since 2001, Spain since 2006), but would have a major negative impact in Australia? That doesn’t make any sense to me. Vodafone has been consistent in its view that regulated roaming is an appropriate solution for countries with large land areas and low population density. There is no evidence mandated domestic roaming has reduced incentives for investment in the many similar countries that have regulated it. Provided the access price is set at an appropriate level (an exercise in which the ACCC has substantial experience and expertise), there is no reason to believe that incentives would be undermined in Australia. RW: The ACCC has previously ruled against declaring a roaming service in Australia. How does this new inquiry differ? DL: That’s not quite right. The last time the ACCC looked at roaming in 2004, it concluded that all the tests for regulating the service were met. In other words, the ACCC said that all the criteria for declaration were satisfied. They only decided against it because significant roaming deals were already being reached on a commercial basis. Fast-forward to today and we have a very different situation. According to research the Australian Communications and Media Authority, Australia has more mobile phones than people – around 31 million subscribers – almost double what it had in 2004. The market has consolidated from four mobile network providers down to three. Telstra­ – the dominant network provider with a market share in regional Australia that ranges from extreme to total dominance – doesn’t have roaming arrangements in place with any other carrier. This is one of the most important ACCC inquiries for many years, which has the potential to finally bring coverage, competition, and choice to regional Australia. We’re looking forward to an open, robust, and factual debate that places the interests of consumers and the benefits of competition at the heart. *Vodafone made a public submission to the Australian Consumer and Competition Commission’s (ACCC) inquiry into whether or not domestic roaming should be regulated in Australia. The public submission outlines evidence that domestic roaming should be regulated. 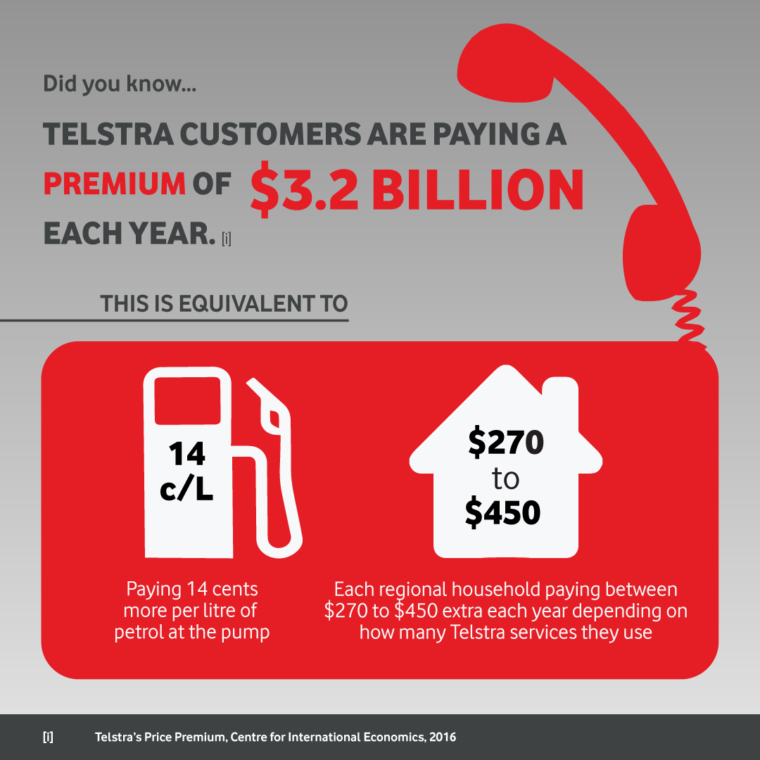 ** The Telstra Price Premium report published by The Centre for International Economics (CIE) was commissioned by Vodafone. We wanted an independent assessment of the level of effective competition in both the fixed and mobile markets, and the economic impact it has on consumers. As Content Producer of RedWire, Aimee is a passionate storyteller about people, technology, and anything else that requires her to use a bit of journalistic detective work.